CarGurus has 18,004 nationwide Sierra 2500HD listings starting at $3,675. Need a redesigned heavy-duty full-size pickup for those above-average towing and hauling jobs? 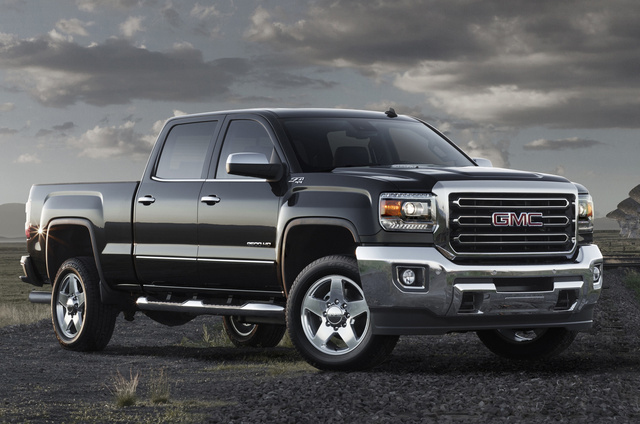 Check out GMC’s 2015 Sierra 2500HD portfolio. A new aerodynamically enhanced profile and a rebuilt interior give this latest generation of Jimmy’s legendary workhorse more capability, a comfier atmosphere and, for this year, a 6-passenger, 4-door Double Cab configuration that meshes well with the returning 3-seat Regular Cab and the re-sized 6-passenger Crew Cab iterations. Oh, and this debuting Double Cab trim level boasts independent-opening front-hinged rear doors for easier back-seat entry and exit. Further tweaks for this hulking hauler include a larger grille, a more aerodynamic look with inset doors, upgraded interior materials, larger buttons and knobs for glove-shod fingers, added in-cabin storage and updated smartphone-app-toting IntelliLink with a new 8-inch color touchscreen. The improved EZ-Lift tailgate and new rear bumper steps, meantime, grace 2015 trims as either standard or optional equipment. Beds, of course, remain offered in the standard 6.6-foot and 8.2-foot long-bed configurations, with Regular Cab trims coming only with the long bed. Wheelbases, meanwhile, run 133.5 inches to 158.1 inches, depending on cabin type and bed length. For 2015, Jimmy’s Sierra 2500HD is once again expected to be delivered in 4 trim levels, the entry-level Base, the up-featured SLE, the plush SLT and the flagship Denali. The SLT and Denali iterations are offered only with the Double Cab or Crew Cab, and again, rear-wheel drive (RWD) is standard, while part-time 4-wheel drive (4WD), flaunting hi-lo gear selection, auto-locking hubs and a locking rear differential, remains available. Again, depending on the trim level selected, look for the 2015 Sierra 2500HD to pack 17- or 18-inch wheels; a trailer hitch and wiring; vinyl, premium cloth or leather upholstery; full power accessories; heated and ventilated power-adjustable front seats and memory for driver's settings. Cruise control and tilt-wheel steering return for this year, as do manual air conditioning in lower trim levels and dual-zone climate control in upper-level variations. The Denali is again expected to boast a power sliding rear window, power-adjustable pedals and a heated steering wheel as standard equipment, all of which should remain optional for the SLE and SLT. All trim levels sport a new-for-2015 4.2-inch driver information display, with the Denali boasting the upgraded 8-inch display for infotainment, IntelliLink and Bluetooth functions that’s optional for lower trim levels. SLE and higher trims also sport standard OnStar Directions and Connections technology. Entertainment, meanwhile, evolves from a 4-speaker AM/FM stereo in the Base Regular Cab trim level to a 7-speaker Bose premium system with a single-CD player and satellite radio that adorns the Denali. Said luxury-laden Denali also sports, besides a rear-view camera, standard hard-drive-based navigation that again should remain available to the SLE and SLT. Further options in selected variants of the 2015 Sierra 2500HD stable are slated to include a power sunroof, upsized and upgraded wheels, beefier axle ratios, added interior refinements, rear-seat DVD entertainment, remote engine start and, new for 2015, front and rear parking sensors. Down to the nitty-gritty, the standard powertrain for the 2015 Sierra 2500HD stable remains the Flex Fuel 6.0-liter V8 mated with the capable 6-speed heavy-duty automatic transmission. Look for 360 hp and 380 lb-ft of torque out of this peppy V8, with towing maxed out at 14,500 pounds with the proper equipment. Additionally, this variable-valve-timed (VVT) plant can be tweaked to burn compressed natural gas (CNG) for cleaner running, though power numbers drop significantly. When more grunt is needed, a potent 6.6-liter turbodiesel V8 remains available for your extra-heavy trailer-toting duties. This blown diesel V8 pounds out 397 hp and 765 lb-ft of torque, managed by the tough Allison 1000 6-speed shiftable automatic transmission. Towing on the standard hitch is maxed out at 17,800 pounds, and fifth-wheel wagon loads top out at over 23,000 pounds. Payloads, meantime, can be as high as 4,212 pounds with an available High Payload Performance Package added on. Finally, standard safety features lineup-wide for the latest Sierra 2500HD edition include 4-wheel antilock brakes (ABS), traction and stability control, side-mounted airbags, front and rear head airbags, daytime running lights, front fog/driving lights and, standard in higher trims, turn-signal-integrated mirrors and OnStar emergency assistance. Also debuting this year is an available Driver Alert Package flaunting forward-collision alert, lane-departure and blind-spot warnings, and a Safety Alert driver’s seat. What's your take on the 2015 GMC Sierra 2500HD? Wheatfarmer How does the GMC Sierra 2500HD steer? If it handles like my 2002 Chev 1500 I will buy one. I can go 100 clicks down a gravel road and it handles beautifully. I don't try that in my 2008 Dodge 2500 as I have stated already it is very loosey goosey and doesn't handle well at all. Users ranked 2015 GMC Sierra 2500HD against other cars which they drove/owned. Each ranking was based on 9 categories. Here is the summary of top rankings. Have you driven a 2015 GMC Sierra 2500HD? 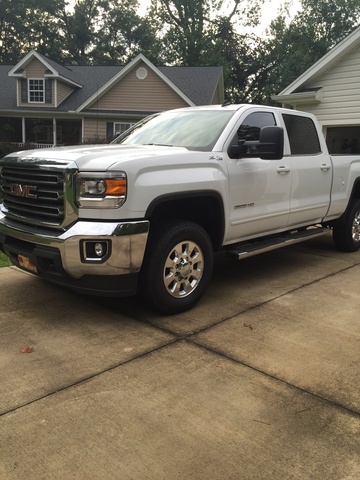 I have a 2015 GMC Sierra 2500HD Denali. I have replaced the stock diesel fuel tank with a Transferflow 60 gallon tank. Is there a way to reset my LCD fuel gauge to reflect the new 60 gallons? When I put my recently bought used truck in 4×4 low today it would not go past 39 mph. Why? Does low stand for the speed? I thought it was referring to the terrain.